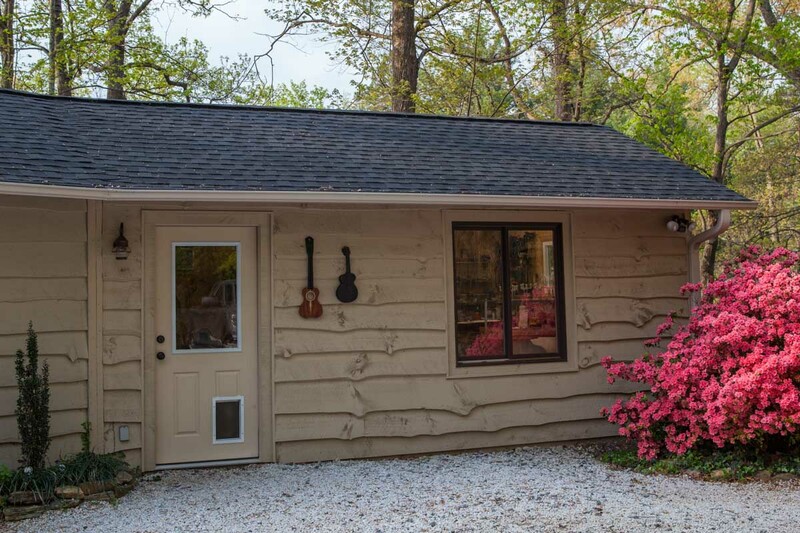 His journey into luthiery came on the heels of a thirty-five year career as a custom home builder and carpenter. His love of playing music combined with these skills made for a natural transition into custom guitar and ukulele building. 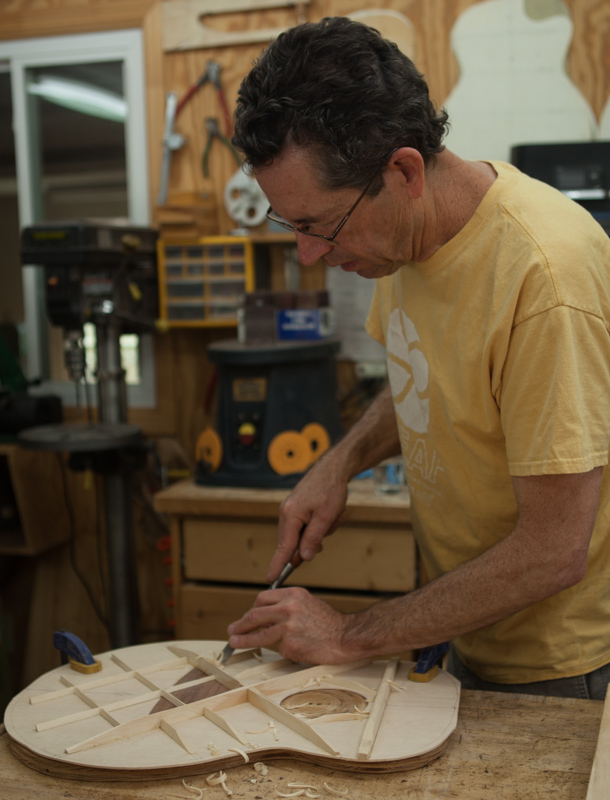 What started as a hobby, building ukuleles out of the garage, hit overdrive once Jay built his first guitar under the guidance of Virginia luthier, Wayne Henderson. 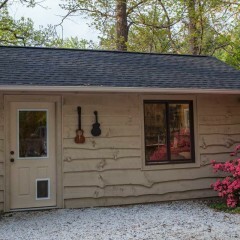 In fact, the day he finished that first guitar was the day he began building the workshop. Over the years Jay has studied with mentors Ervin Somogyi, Charles Fox and Tom Ribbecke. With over 250 instruments under his belt Jay continues to develop his craft. Lichty custom guitars, ukuleles and fiddles have shipped to customers from Australia to California, from Kazakhstan to Nashville. While most of Jay’s customers are casual players, some Lichty players are well-known in their own right. Professional musicians who play and praise Lichty custom instruments include Bonnie Raitt, Geoff Achison, Randall Bramblett, Noah Guthrie, Kimo Hussey, Richie Williams and many more. Jay’s one-of-a-kind instruments have been featured in numerous exhibits and have gained robust media coverage from features on CNBC to feature stories in award-winning publications such as Fretboard Journal, Acoustic Guitar, Ukulele Magazine, Garden & Gun magazine and more. While Jay works in the shop, his wife and business partner, Corrie Woods, works on getting the word out. She manages all facets of promotion, including design and maintenance of the website, photography and media outreach. Together with their beloved shop dog Ziggy they make a great team! We want your custom Lichty to give you a lifetime of play and then some! Working with premium domestic and exotic woods and the finest materials, Jay crafts heirloom quality instruments one at a time. 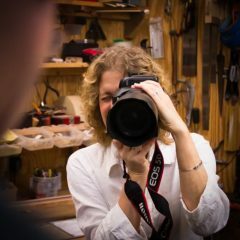 Most have been carefully designed in collaboration with the customer and crafted by Jay to exacting specifications to ensure that the finished custom guitar, ukulele, fiddle or viola fits like a glove; visually, aesthetically and tonally. Every Lichty carries a lifetime warranty on workmanship and materials to the original owner. A core part of the mission at Lichty Guitars is to give back to the community, locally and globally. That give back happens in many ways, from helping to build awareness about organizations making a difference to the donation of Lichty handcrafted instruments for auction and raffle fund-raising campaigns. Of particular note is an organization we are proud to serve on the Advisory Board for – the Ukulele Kids Club. The UKC is an organization doing a world of good for hospitalized children and for music therapy programs in the US and across the globe. Learn More about the UKC and Lichty Guitars’ Giving Back Program.